In the last years of my mother’s life she lived in southern Illinois while I lived over 300 miles away in northern Illinois. I worked a Monday-Friday job and my husband was a pastor which meant his job required work on the weekends. Thus, it was hard to have a chance to get away for a few days to visit her. We took some vacation time and made a visit three or four times a year. When we drove in the driveway she was always standing at the door anticipating our arrival. Every time we left she would stand on the porch and wave until we were out of sight. Becoming interested in doing genealogy research on my family I began asking Mom and Dad to tell me more about their childhood. On one of our last visits, they took my husband and I to the cemeteries where grandparents were buried, to the place where my mother grew up, to the school my dad attended as a small boy. My husband took a videotape of our adventures that day. In February 2006 my husband retired and I was so excited as that meant we would have weekends free to visit my parents. Now I could visit more and begin writing down their stories and take pictures of places from their childhood. So, early in April we sat out to visit my parents. I knew Mother would be so happy to hear that I was going to be able to start coming down more and that I wanted to hear more about her childhood and her family. My excitement soon turned to worry. When we arrived I found my Mother in great pain. She had made a doctor’s appointment for that afternoon. I took her to the doctor expecting to hear that she had some “bug” that would require some medicine and rest. All prepared to stay and help her recover, I was shocked when the doctor admitted her to the hospital for tests. The first couple of days seem pretty routine and we had some great visits in her hospital room – just the two of us talking. On the third day Mom took a turn for the worse and I called my two sisters to come. Something was wrong – much more than routine. Mom quickly went downhill as the days passed and it became clear she was not going to make it. The time came when we had to make that dreaded decision. Do we continue to do treatments that were clearly painful or do we let her die with dignity and in peace? A tough decision. A few days later Mom was gone. Gone – before I got to write down those stories. Gone – before I got to spend more time with her. It has now been thirteen years since Mom left. As I age myself I begin to understand her more. I find myself doing and saying things to my children that she once did and said to me. Often I see that my comments are not welcome. I’m being bossy, old-fashion, interfering. All the things I once thought about my mother. Now I realize while she may have been (and I certainly am) bossy, old-fashion and interfering, her motives were one of love. When Will Daddy Stop Being Dead? Yesterday it was 37 years since my first husband was killed in an accident. He died when the car he was working on fell on top of him and crushed him. My two young daughters came home from school and found him there. Needless to say, it was quite a traumatic experience for them. All of the events surrounding that day are forever entrenched in my mind. But one memory that still haunts me occurred about six weeks after the funeral. At the time of his death as I tried to comfort my daughters, my youngest daughter seemed not to really be upset or need any comforting. As family and friends came in for the funeral she enjoyed playing with cousins and friends and appeared to have no sorrow for her father’s death. At first I thought it was just shock but after the funeral was over and weeks began to pass she still shown no sign of any trauma or sorrow. I began wondering what kind of daughter I was raising. Finally, about six weeks later she came to me and asked a question I will never forget. It was then I realized what she had been thinking all this time. A few months before his death he had injured his back and was in the hospital for almost two weeks. At that time the hospital did not allow young children in the rooms so when I went to see him I would have them stand in the yard just outside his window. He would come to the window and wave at them. When he was discharged from the hospital we had a party! The girls made a sign “Welcome home Daddy” and we hung it just over the door to the kitchen. We had cake and ice cream and celebrated that Daddy was home with us once again. At that moment, I realized my young daughter did not understand what “dead” meant. She had apparently thought it was just another injury and that Daddy would be coming home again. That moment was one of the hardest times of my life. I still remember her face! Tears swelled up in her eyes and she fell into my arms and cried. Clearly her heart was broken. No one can measure the trauma and pain both my daughters experienced because of their father’s accidental death. Or the pain I felt seeing them hurting and feeling so inadequate for the task of helping them in this difficult time. But one thing I learned – and I trust they did too. Although death – or sometimes divorce or abandonment by a father – can leave us fatherless, we still have a heavenly father who loves and cares for us. In the months and years ahead I have both experienced that heavenly father’s protection and love for me but also seen His help to my daughters. I do not pretend to know why my daughters lost their earthly father but I thank God that we have a heavenly father who cares and who helps us when we walk through that valley of the shadow of death – or any other difficult time. And I praise God that He has given both my daughters a family of their own to love and to have their love. I also praise God that as a Christian I believe although that little girl’s daddy could not come back home to her – some day she will join him in the new home God has made for them both. Recently I posted a blog on my memories of my favorite Christmas gift ever. After posting that I have found myself awake in the middle of the night thinking of other Christmas memories. Seems this first post has now led to more. In my second post I shared how my future husband proposed to me on Christmas Day 1968. We had thirteen wonderful years together and were blessed with two beautiful daughters. One of the memories that came to me in the middle of the night was a Christmas that was lonely and difficult. In March of 1982 my husband (whose proposal I wrote about in a previous post) was killed in an accident. This was the first Christmas my young daughters and I spent without him. Although it has been 36 years since that Christmas I can close my eyes and still feel the pain, the deep unspeakable sense of being alone. But along with these sad thoughts comes one that makes me smile. Beauty is only skin deep …but ugly goes all the way to the bone! In this day of PC I suppose these jokes would not be appropriate to many. That Christmas night, seeing the sad faces of my little girls, I was determined to not let their Christmas night end in terrible sadness. Out came the book. I had us all get in our pajamas, climb into bed and read the jokes. Some of the jokes were funny, others not so much. But I laughed at each one as if it was the funniest thing in the world. After reading the book and staying up way past their bed time, I laid with them asleep in my arms and thanked God that in the midst of sorrow, if we look for it, we can also find joy. We had spent Christmas Eve with our extended family. We were made so sad because during the entire day no one said anything about our husband/father. It was as if he had never existed; as if his absence was of no importance to anyone. Before returning home, I expressed my hurt to my older sister. I think I made her cry as she explained they had all agreed not to mention his name because they were afraid of causing us pain. They thought they were doing the kind thing. Sadly they had not. So – if you have family or friends who have lost a loved one this year – or really any time in the past – don’t be afraid to mention them. Say how you miss them. Share memories you have of them. God has blessed us and He brought a good man into our lives a few years after this Christmas and my daughters have married and have a family. Our Christmas this year will not be lonely and we are happy. But we will always remember this wonderful man that made that Christmas one to remember. And in the midst of our celebration, our thoughts will remember dear, dear Lonnie Lott. In our small group Bible Study we have been looking at the names of God in the Bible. One of those names is El-Roi, “the God who sees me.” I wrote about the basis for that name recently in The God Who Sees Me – Part 1. Reading that story led me to think of times in my life when I experienced that same sense that God had seen me. Times of my own fear or suffering when God ministered to me in a clear way that let me know He saw me. He knew my distress and He gave me assurance that He was with me and would help me in this time of difficulty. Almost 20 years later, God again assured me that He was the God who sees me. While working at the University of Missouri Extension office in Perryville, Missouri, I anticipated the daily call from my oldest daughter. My two daughters would ride the bus each day from school to our home in the country. Their father who worked the midnight shift would be getting up and waiting to greet them. Although he was always there to meet them, I still had my daughter call me just to let me know they were home and see how their day had gone. Mommy, I think Daddy is dead! My two daughters – only 6 and 11 – had come home to find their father laying in the driveway underneath our car. He had been working on the muffler and the jack had apparently slipped and crushed him. He had always been very careful when he worked on the car and to this day I do not understand why he raised the car with the jack and did not use anything to stabilize the car or the jack. It was not like him to be so careless. I always remind my family to be careful because it only takes one moment of carelessness to bring disaster. Hanging onto the phone, I felt my heart would stop! It was hard to believe it was really true but the moments that followed showed me it was true. At 33 I was a widow with two little girls to raise. All kinds of questions flooded my mind. How would I get through the days, the years to come without my best friend? How would I help my daughters cope with not only their father’s death but the horror of finding him crushed beneath the car? How would I be able financially to take care of them with the loss of my husband’s salary? Who would be there to take care of them when they got home from school since I would be working? How would I pay for the funeral? Should we stay in Missouri or move back to be close to family? Could I make it on my own far from family’s support? On and on the questions raced through my mind as I tried to grasp what had happened. It still seemed like a bad dream. Surely I would wake up soon and be in my own bed with my husband beside me and I would laugh at it all. But it was not a dream. For the next few days I was numb. Planning the funeral, trying to comfort my daughters, trying to find answers to all those questions, slowly the sense of being in a dream began to leave and reality hit me hard. Blessed to have family and friends who loved me and supported me, still the time came when everyone went home and back to their lives and I was left with my daughters to face the future alone. This realization came to me the first night after everyone had left. I fixed supper for the three of us and started to place the dishes and silverware on the table for us. Turning from the table to get the food from the stove, I realized I had put four plates and four setting of silverware on the table. With tears streaming down my face, I picked up the extra plate and silverware and returned them to the cabinet. In the future, we would only need three sets of dishes. I did what I had always done in times of despair. I cried out to the Lord telling Him I did not see how I could make it through the months and years ahead, how alone I felt. Instantly a verse of scripture came to my mind. Today my husband and I visited an old friend to say goodbye. In the final stages of cancer it appears he only has a few more weeks to live. This friend was first my husband’s friend. They met when my husband stopped at a restaurant owned by this man. The restaurant was halfway between our home and the church where my husband was the pastor. Driving back and forth between the church office and our home every day, my husband often stopped in for lunch. My husband and Richard shared the same sense of humor. They loved to play golf together although from the tales they tell me I am not sure just how good they were at that game. But they had a lot of fun and shared silly jokes with one another. Eventually Richard sold his restaurant but continued there as manager. After my retirement I often joined my husband and Richard for breakfast there. They kept me laughing so hard as they traded one silly story after another. About two years ago Richard shared with us that he had cancer. He was optimistic saying his cancer was a slow-growing one and he would probably die from something else before the cancer got him. My own story was an encouragement to him. (See my story at Life — What a Wonderful Gift!) When I had my battle with cancer, the doctor had not given me much hope for survival. Yet here I was still alive and cancer-free. To be honest, I was not too much concerned because I truly thought this slow-growing cancer would not take his life. Time passed, Richard began to grow thinner. Complications set in and he spent too many days in the hospital. Still, I clung to hope. I had beaten cancer and he would too. But, for Richard, the battle appears over. The doctor has taken him off all the medicine fighting cancer and is talking now about “quality” of life. Hospice has been called in. How do you tell a good friend goodbye? Do you laugh and talk about all the funny and happy times you have had? Do you rejoice in the hope that we as Christians have that it is not really “goodbye” but “see you later?” Do you let him see the tears in your eyes as you contemplate life without him? And, to be totally honest, since Richard is the same age as my husband, it makes us realize that we are also in the that final stage of life. So we ask ourselves some questions. Do we have our house in order? Are we truly ready to face our Savior? Coming back home, we have mixed feelings. Sadness, of course. But also thankfulness for the time we had with Richard. Perhaps most of all, a new determination to enjoy each day as we live it. I Never Thought It Would Hurt This Much! Almost two years ago my daughter and son-in-law began a journey to adopt twins. Their mother had died shortly after giving birth. Since there was no father in the picture, these little babies needed help if they were to survive. My daughter and son-in-law reached out in love to provide that help. As I looked forward to being a grandmother again, I imagined that when I first saw the twins my feelings would be those of any one who sees precious little babies. I would feel compassion and warmth, even affection. As the days and weeks passed, I envisioned that as I helped give them a bath, sang to them, rocked them to sleep, that warmth and affection would grow to be the love of a grandmother. Less than 3 months their birth, little Jacobi Israel died. I was heart-broken then. But my pain was for my daughter. As I saw the sorrow and pain in her eyes, my heart ached for her. As for me, I only felt regret for what would not be. 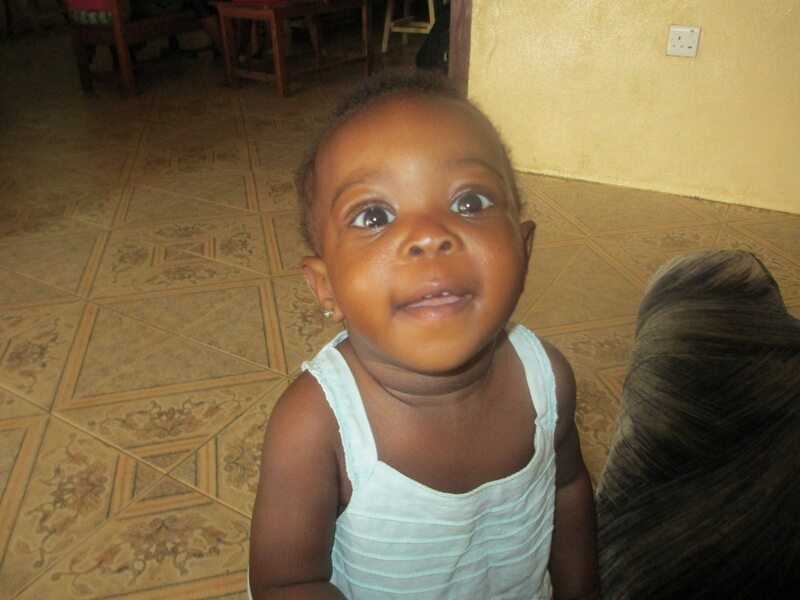 Then my daughter went to West Africa and actually spent time getting to know Precious Hope. As I saw the pictures and the videos of Precious taking her first steps and heard her little voice making those first baby sounds, something happened that I did not expect. I fell in love with that little girl – without ever singing to her, rocking her to sleep, holding her close to me. She was my granddaughter! There was not compassion and warmth in my heart – there was a grandmother’s love. I could hardly wait until my daughter and son-in-law could bring her home to us. Almost a year from the death of Jacobi, little Precious died also. While I felt such sorrow for my daughter and son-in-law, my grief was for myself – for the granddaughter I almost had. For all the dreams I had for her and me – dreams that would not happen now. I suppose no one who has not walked down that scary, unpredictable road of adoption can understand my feelings. Today Precious would have been two years old. I thought today we would be celebrating her birthday.